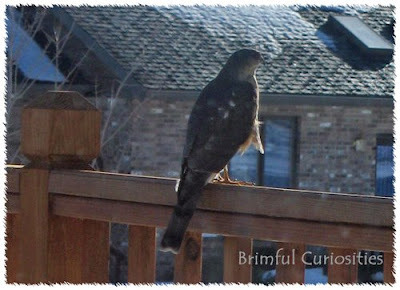 Young hawk on our deck a month ago enjoying the vantage point. Thought it would make a great WW during National Wildlife Week (March 16-20). Oh, what a bird, sitting there, looking for food? What a great capture. My son would have been so excited to see a hawk in our backyard. How cool is that! Great shot. how cool! what a great photo! Great pic. We love our hawks!! Great photo! We LOVE wildlife! We often have deer in our yard and hawks above. Today we saw a bald eagle soaring above! Great pic! I love seeing Redtail Hawks flying around our area.